Today is Children in Need day. The BBC televised appeal will see heartstrings tugged and purse strings loosened however some children charity appeals may not be as charitable as they first appear. Charity bags have been dropped through central Eastleigh this week urging people to donate clothing to a charity called ‘Help Sick Children’. Although this charity is registered by the charity commission – an examination of the register suggests it is run by Lithuanian textile sellers operating from a domestic address in Feltham. The bags state that £70 per tonne of clothes sold by the company is donated to unspecified children charities – this may seem generous but the current going rate for recycled textiles is £600 to £1100 per tonne. Large charities like Oxfam are able to sell their surplus donated clothing and raise £500 a tonne. Enquires show that there are many clothing recycling companies who have set themselves up as charities – a relatively simple procedure in the UK – but send less than 10% of the value of the donated items to their nominated good cause while enjoying the status of a charity. This is all legal – however these companies still need to be licensed to carry out house to house collections. A phone call to the licensing department of Eastleigh Borough Council confirmed that ‘Help Sick Children’ has NOT been licensed to collect door to door in Eastleigh and neither do they have a Home Office exemption from the requirement to licence. The advice of the council is not to donate to ‘Help Sick Children’ and to throw their bags away while they investigate the matter further. 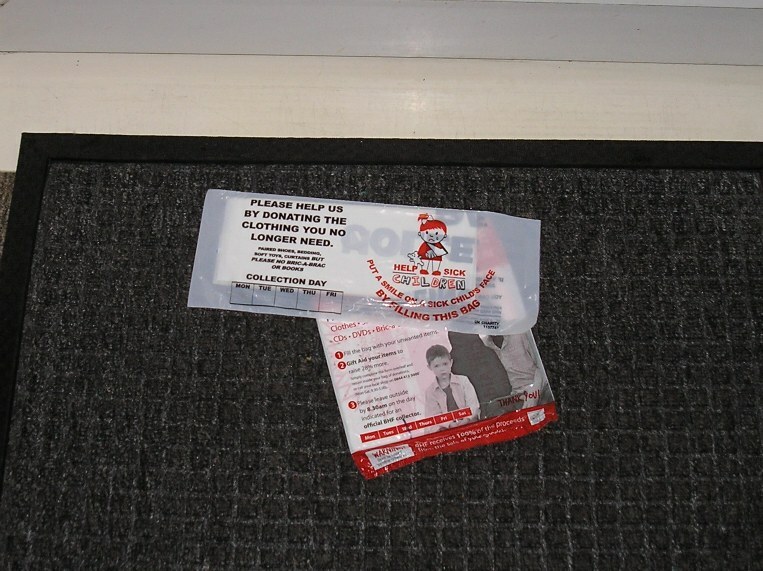 Bogus collectors are distributing leaflets and bags across the region claiming to collect for charity. Many bags look like they are collecting for charity but actually they are private companies operating for profit. As the price of textiles has risen there have also been incidents of theft and vandalism in some areas of Hampshire as people try to gain access and steal the clothing from the textile bring banks. For example, the Hampshire & Isle of Wight Air Ambulance Service who collect clothing to help fund their service have been affected by a bogus firm collecting textiles and bric-a-brac operating as the ‘Air Ambulance Service’. This is currently being investigated by Hampshire Trading standards and the Police.